Prejudging someone is a huge mistake. Yet we all do it now and then, even though we know it’s wrong. My wife and I were at Opening Bell Coffee (which apparently is a recurring theme in my blog this week) listening to some music, as we frequently do. A woman with blonde hair was in the back by herself and focused on the performer. I, in passing, thought she must be the girlfriend of the singer on stage. My wife went and got some Iced Tea from the back and said, “Do you know that girl in the back? She said she’s a musician and is new in town. I told her you would come back and talk to her” Now, I love that there are hobbyist musicians in the world. I wish there were as many “weekend musicians” as there were “weekend golfers”. I think the world would be a better place if we had more people making and supporting music. But, I just don’t want to talk to ALL of them, especially when I’m out listening to music. So, based on faulty reasoning, I went back expecting a hobbyist and introduced myself. You can tell instantly, by how someone talks about music and writing if they are serious about it. I knew instantly that Kristin was very serious about music and writing. Just in a brief conversation I knew that this was a very intelligent person who was strongly passionate about the things she believes in. I’m proud to introduce all of you to Kristin now. 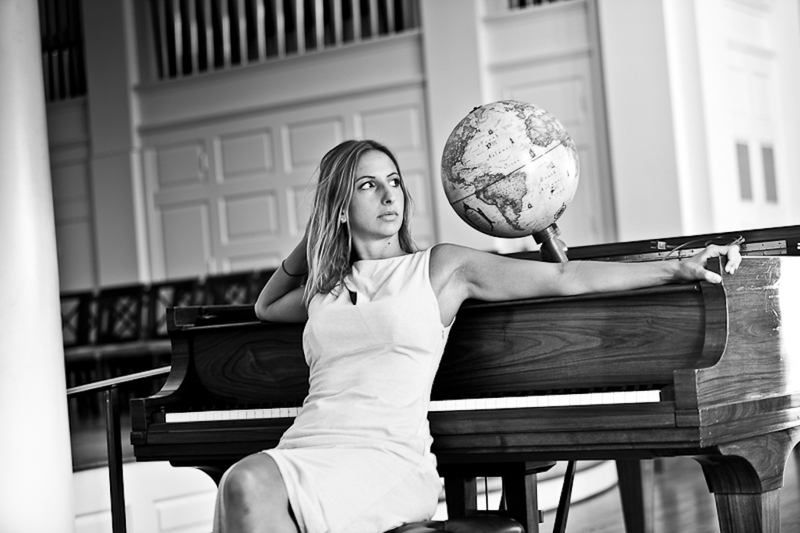 Kristin Center is an American concert pianist, contemporary art-song composer and singer-songwriter known for her unusual writing style that combines Latin funk and Impressionist Classical forms with a fierce lyrical message of open your mind. I really like the theme for your Kickstarter and the idea of doing a video album, instead of a traditional CD. How did that all come together? The concept of fusing the music portion of the project with something completely separate that I’m passionate about really has been in fruition for years. This kickstarter project was the perfect time to join them. Video really adds a whole other level of connection with a song. Also, I think part of working in any competitive field is understanding what is unique about you. Everyone does an album on kickstarter. Why would I want to be one of the masses. Now, it takes a lot of writing for me find something I like. I usually sleep on it, for months, and then come back and say, “Nah, I don’t like it anymore.” I probably use about 4% of my ideas. Even when those ideas morph into full songs, I sometimes let them go if they don’t feel right on stage. How did a trained concert pianist become a songwriter? I think it was actually the other way around! I was first a by-ear musician. When I started at the piano I started with sounds, not notes on a page. So I wrote a lot of music without ever writing it down. I still do. My parents saw that out of all the art forms they introduced me to, I was mostly drawn to music. And out of all the instrument affairs I’ve had, I’ve always come home to the piano. I’m a pretty obsessive person, so early on when it came time to really “take on” the piano, for me there was no question but to learn the instrument to the best of my ability. Classical music gradually became a wonderful compositional influence as well as a technique training ground. I’m proud to be someone who believes in things. I’m proud that I always have something to say, and am never afraid to speak up. Above all, I’m thankfully proud that I’m able to speak everything that I believe competently through music. What are your favorite songwriting lyrics? Less is more in a lot of ways with lyrics (coming from someone who has to rap to get everything out occasionally!). I also never hear lyrics without music. Listen to the song when you read these! Play your heart out, be as honest as possible, and remember to look at yourself from your audience’s perspective. Would you pay money for your show? What have you found is the hardest thing when you commit to music as a career? The hardest is the acceptance that now the actual music will most likely come second, music business will come first. Some people have definitely been dealt a lucky set of cards, but for those of us born completely out of the music loop (and out of the money loop! ), you have to be able to pick up a lot of well-rounded skills, quickly. Oh, yeah, and you can never have a bad day in public.